It’s holiday time again, and if you’re like me, you’re thinking about making some sweet treats for family and friends. 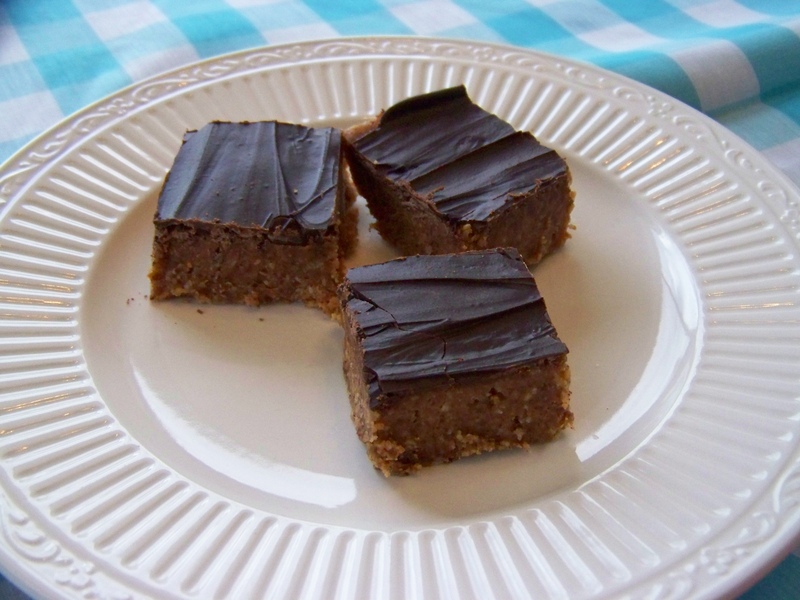 Surprisingly, there are a bunch of great recipes which can be successfully made (and enjoyed!) with honey and maple syrup (and other whole food options) as the sweeteners, rather than white sugar. I have several which are my favorites . . . I’ll have to share them in time. For now, I’m excited to tell you about a blog my friend Krista writes: http://thenourishingapron.blogspot.com/ . Every recipe on her blog is made without cane sugar, and she does a beautiful job of presenting her methods, always with a picture to get your mouth watering! Well here’s something that’s an easy changeover from traditional to non-toxic: hand soap. In fact, it was one of the first things I changed when I became conscious of the negative possibilities of chemical-based care products. Then I began to notice that my daily (mild) headaches were gone for good . . . until I was at a friend’s house and got a headache from the fragrance in her hand soap. It’s really up to you. Bar soaps are luxurious (especially those with a goat milk or vegetable oil base), unless you live in a home with small children, where a bar of soap will inevitably be found in a puddle of water with dirt streaks on top. This is my home, so bar soaps are reserved for the shower, and liquid soaps rule the roost at the sinks. 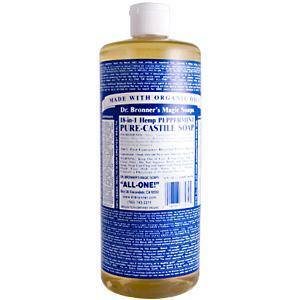 My favorite liquid soap is an old classic: Dr. Bronner’s Peppermint Soap. (At a great price on iherb.com. 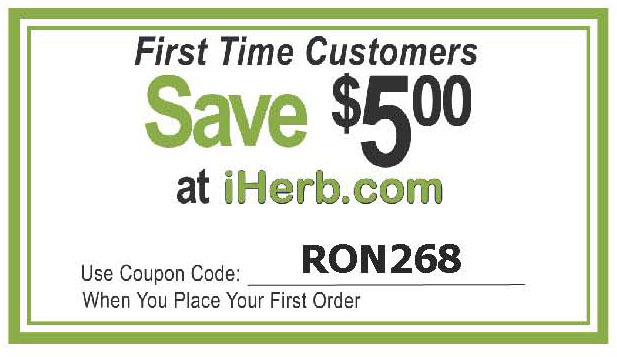 Check out my post iherb.com: Awesome Prices Plus $5-off.) If you’ve been around health food stores for awhile, you’ll know this one quite well, and maybe you’ve brushed your teeth with it (I have, but it isn’t pleasant). For those of you new to this soap, the label is amazing. It reports of couple dozen uses for the soap . . . remember, this is a “classic” in the natural care product world, and it came out when there weren’t a lot of choices for things from shampoo to flea control. Also, there is a lot of crazy mantra/philosophy on the bottle (ever square inch of it) which ranges from distressing liberties with Kipling poems to just bizarre political stuff. I’m not kidding. But, I don’t buy it for the label. In fact, I never display the bottle at all, preferring to buy the 32oz bottle and refill my pump dispensers. This soap is truly concentrated, and must be mixed with water in a 1:1 ratio, at least. (Bonus: a soap requiring this much dilution is really easy on the wallet!) Sometimes I find that even that ratio is too strong, and the pumps clog with the soap over time. Washing out the pumps and adding more water to the soap seems to clear this up. Speaking of pumps, I love the newer pumps which pump out a pile of foam instead of liquid. (My children think they are cool too.) They seem to reduce soap waste and mess at the same time. You may have these types of pumps already with chemical-based soap in them. If so, it’s an easy thing to wash them out when they are empty and switch to a natural liquid soap. Dr. Bronners has several other lovely scents: Almond, Citrus, Unscented, Tea Tree, Lavender, and Rose. I have also tried Dr. Woods Peppermint Castile Soap, but found that it was much more dilute, so the value wasn’t what I was hoping, and the clean scent of peppermint was not there. I switched back to the original. If you are wanting a liquid soap with more of a gel-like consistency, there are several available, including the Lavender Glycerin Hand Soap from Avalon Organics (also available for an amazing price on iherb.com). It’s an elegant solution, and since it is already in a pump bottle labeled with its contents, you’ll have no guest confusion in your powder room. This is a concern in many households, especially in the colds season. However, many antibacterial soaps are toxic; the FDA just recently stated that, based upon animal studies, there is valid concern that Triclosan can have an impact on the endocrine (hormonal) system. Also of concern is the now growing problem of Super Bugs, which are bacteria which have become resistant to antibiotics and anti-bacterial cleansers. Natural soaps made with Lavender, Tea Tree, or Peppermint oils are known to be mildly antibacterial; they won’t kill on contact, but they do inhibit bacterial growth. Researchers believe that because the chemical makeup of the plants, and their essential oils, are slightly different from year to year, it leaves bacteria guessing, so to speak, and never allows them to develop a specific resistance. However, thorough hand washing with plenty of warm water and soap will wash away bacteria, rather than attempting to kill them on contact. Teach your children (or yourself!) to wash properly and often with a mild soap, and you are better off than depending on a harsh chemical to do the job, while it simultaneously breaks down the natural barrier of their skin. And if you have illness in your home, clean “touch spots” (door handles, light switches, hand towels) often, air out your home at least once a day, discard all used tissues immediately, and quarantine the sick as much as possible. OK, so this is totally just free advertising for iherb.com, but I love this site, so why shouldn’t I rave about it and share it with all of you? I first found iherb.com when I was looking for better prices on supplements that my Doctor prescribed me, like Carlson’s Cod Liver Oil. But I soon found that they carried a lot of the personal care products and specialty foods (like Bob’s Red Mill flours, nuts, etc.) which I was purchasing at Whole Foods Market, and for discounts of 15-40%. Also, I became very impressed with how well they wrapped each item in bubble wrap, and had a “no questions asked” customer service attitude. And the site is just really easy to use and find what you need. It isn’t hard to meet the minimum for Free Shipping: $40 order (I order every other month to insure I’ll never pay shipping.) And if I order on Monday I have my stuff by Thursday (I live in the Northwest, and the iherb warehouse is in California). If you’re making an order, use my coupon code RON268 and you’ll get an additional $5 off your order (first time customers). Woo hoo! I love a great deal! And if you think you, or a group of your friends, would make larger orders, here’s how you can save more: after your first order, email iherb and ask them about a VIP Discount. I did this, and they told me that I would have to make an initial order of $500, which would be discounted by 15%. (So my first order was $500 – 15% = $425, and I pulled a bunch of friend orders together to do that.) After that, every order I make has an additional 10% off minimum (it goes up to 12% off for $120+, 14% off for 240+, 16% off for 480+). Since I’ve made an order every other month for the past several years, it has really been worth it. OK, so what’s NOT to love about iherb? You still have to read the ingredient labels: in addition to great products, they stock lots of natural products with bad ingredients, like parabens, etc. This is the same as Whole Foods: you must read your labels. (Read my post How to Read an Ingredient Label.) Fortunately, iherb has the complete product label listed for each item, which makes this easier than any other online store I’ve seen. 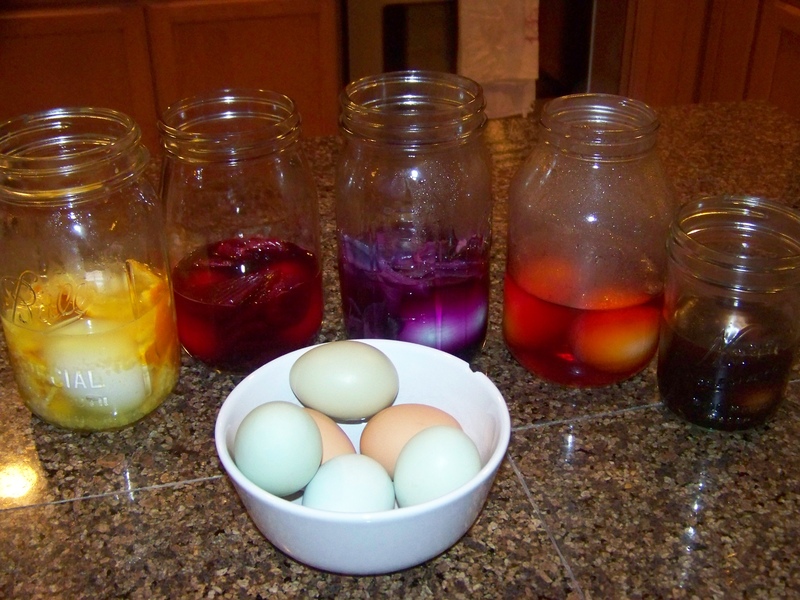 I’ve been intrigued by the idea making your own egg dyes from foods. 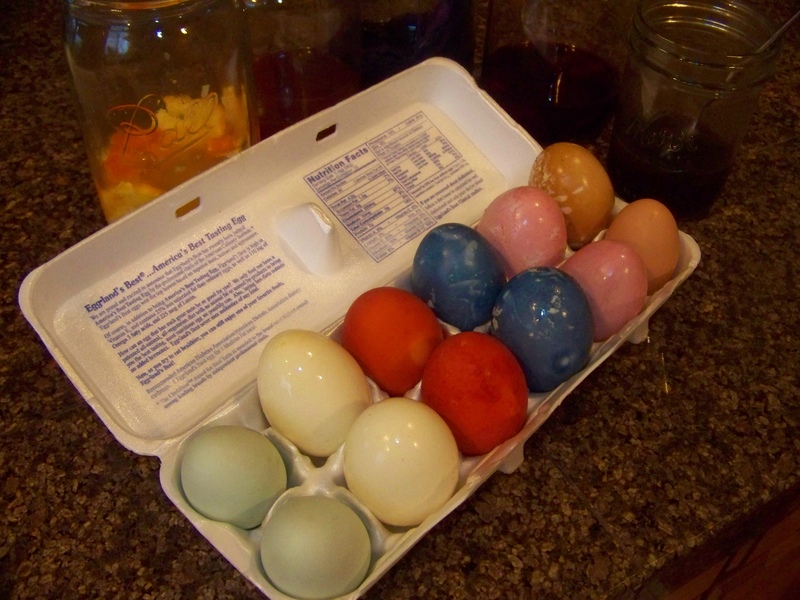 Artificial dye isn’t a great thing for anyone to be eating, and although we don’t eat the egg shells, in years past some dye has soaked through the shells onto the hardboiled eggs. So this year I decided to try making my own dye. The eggs should be left in until you are happy with the amount of color, and then removed from the dye and dried with paper towels. It looks to me like the beet colored ones may be done tonight (after only 1-2 hours), but the rest will be going in the fridge in their dye overnight. I will post a picture of the final product tomorrow! My children thought the whole process was amazing, especially which kind of food we were using for each color. Of course, the event wasn’t the same as the dipping procedure we’ve done in the past . . . it’s more watch and wait, and less hands-on for the kids. (But it’s also less mess for mom to clean up!) They will get to help me pull the eggs out in the morning and dry them. If we had started earlier in the evening, we would have had time to use a white crayon to make designs on the eggs before their dye bath; maybe next year! I was surprised that it wasn’t the beet juice that gave the strongest color, but the cabbage and onion dyes. I actually took the eggs out of the onion dye last night, leaving all the rest in overnight. The yellow (orange peel) was a disapointment, with only a tinge of yellow staying on the eggs. Perhaps a naval orange isn’t the right kind of peel, but I think I’ll try paprika boiled in water next year. We noticed that it was easy to make smudges on the eggs when blotting the eggs dry, so be careful, or rub with an intentional pattern in mind. All in all, it was a colorful success!